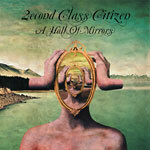 A Hall of Mirrors is the third studio album from London based DJ/Producer 2econd Class Citizen. As the title suggests, this project is a sonic journey into the world of perception. Fusing the analog and digital worlds, 2CC builds on his signature blend of psych/hip-hop and amplified folk that has been keeping listeners spellbound for years. Guests include singers Graciellita and Boobie Watson, legendary Los Angeles emcee Myka 9 from the Freestyle Fellowship, The Herbaliser (Department H), Kenneth Winkler along with studio musicians recorded in Brighton, UK and Innsbruck, Austria. Original Artwork created by Albane Simon with typography alterations performed by Openmind (Ninja Tune).